I am given a DC line with a variable voltage along a set scale: let's say 0-10V. 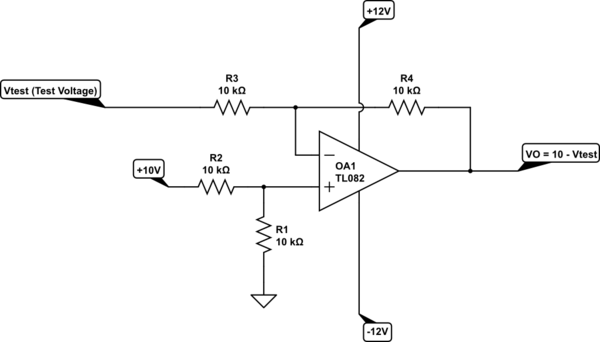 I would like to send an output DC line with a voltage reversed along that scale. 0 Volts in becomes 10 Volts out. Note that the polarity is not reversed. My question is: is there device I can buy or a relatively simple wiring scheme that can get me there? My intention is to take a signal from a PID tension-controller that controls a brake, and instead power a motor when needed. Oof, good question on the current. Let's say it is one amp. Note that this circuit is not easy to build as it looks even for an experienced person because of the need of a negative supply (-12V). Also, generating the reference voltage ("10V" to the left-side leg on R2) can be problematic (e.g. voltage divider or from an outer generator). Not the answer you're looking for? Browse other questions tagged voltage dc reverse or ask your own question.